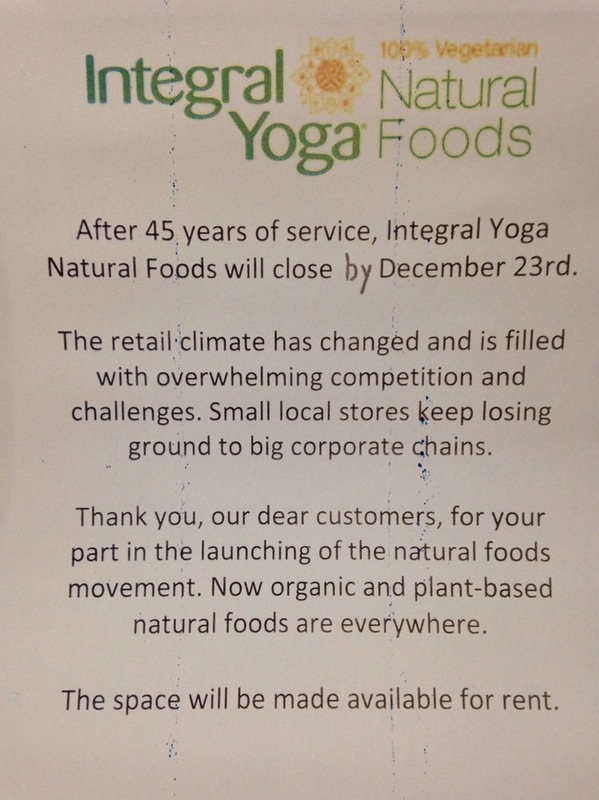 People who work there told me it's the fact they're not the only organic/natural/health food store in the neighborhood anymore. They used to be pretty much it, but now not only do you have Elm Health around the corner on 7th Ave, but you can get organic milk and ingredients in almost any super market. And. while the Institute owns the building, the health food store has always been a separate business and has always paid rent. In a sense they must feel successful. As they say, the foods they specialize in are now everywhere. While that makes it harder for these sorts of stores to survive, maybe the world has a bit less pesticides as a result. living in the immediate neighborhood we take this as yet another loss of a grocery. ugh. I used to walk by this every time I got out of the subway on 7th venue en route to Myers of Keswick, the Brit food store on Hudson Street. Sometimes I'd go in and buy something. Now I can go to Perelandra on Remsen Street in Bklyn Hgts. It's been a long time since I was on this street. I always appreciated the architecture, and it was so much nicer than walking along 14th Street. Went by today, Dec. 15 ,and the food store is permanently closed. The Institute remains open. That part is nice, it's a good point. 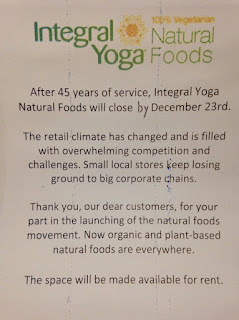 It's sad though because integral yoga was the only health food store that was completely vegetarian. The other ones aren't.